The newscasters and editorialists will be all abuzz about the Scopes trial this week on the 80th anniversary of America’s most famous court trial. As usual, most will spin this story in a way that will cast a bad light on biblical Christianity and make the trial out to be a triumph of “science” (i.e., evolutionism) over religious fundamentalism (creationism). But the trial had little to do with empirical science and much to do with religion. How well do you know the facts about the 1925 Scopes trial? Is your knowledge mostly based on the Hollywood depiction or the transcripts and other historical accounts? Much of the confusion about what happened at the Scopes trial is a result of the movie/play Inherit the Wind which is widely perceived as a docudrama of the trial. In fact, Inherit the Wind describes events that are often precisely opposite of what actually happened in the Scopes trial (see sidebar). The real events of the Scopes trial are far more interesting than Hollywood “history” and deserve careful consideration by those who are concerned about evolutionary indoctrination in public schools. The Scopes trial took place on a hot July in 1925 in the little town of Dayton nestled in the Cumberland Mountains of Tennessee. In a time when modern court trials can drag on for months or even years, it is amazing to consider that the Scopes trial lasted only 12 days (July 10-21)—including the selection of the jury! But why did this trial occur in Dayton, and who were the people and what were the issues that made this trial so important? The Scopes trial was initiated by the leadership of the American Civil Liberties Union (ACLU) in New York City. The ACLU became alarmed over “antievolution” bills that were being introduced in the legislatures of 20 states in the early 1920s. These bills were all very similar and forbid public schools to teach the evolution of man, but generally ignored the evolution of anything else. Advertisements were placed by the ACLU in Tennessee newspapers that read in part: “We are looking for a Tennessee teacher who is willing to accept our services in testing this law in the courts.” George Rappleyea, a mine operator in Dayton read the ACLU ad in a Chattanooga newspaper and decided that he would like to see such a trial held in Dayton. Rappleyea’s interest was neither scientific nor educational, but rather he hoped that hosting the trial would bring national attention to the town of Dayton and encourage investments in his mining operations. Rappleyea approached a young friend named John Scopes who had taught math and coached the football team for one year at the local Rhea County high school. Scopes had no background in science and had little interest or understanding of evolution. Indeed, the only qualification Scopes had as a science teacher was that he filled in for an ill biology teacher the last two weeks of the school year. Nonetheless, Rappleyea talked a reluctant Scopes into participating in the ACLU’s test case. Although Scopes never taught evolution during his two weeks as a biology teacher, and thus really didn’t violate the Butler Act, it was considered sufficient that the class textbook, Hunter’s Civic Biology, did cover the evolution of man. For example the Hunter textbook speculated that in his early history, “man must have been little better than one of the lower animals” and concluded that, “At the present time there exist upon the earth five races or varieties of man ... the highest type of all, the Caucasians, represented by the civilized white inhabitants of Europe and America.” Sadly, this sort of blatant racism in the name of evolution was enthusiastically endorsed by most of the academic world as well as by many Christian groups. After the ACLU agreed to accept John Scopes for their test case and pay all expenses, he was arrested for teaching the evolution of man and immediately released on a $1,000 bond.The Dayton lawyer who served the warrant for Scopes’ arrest was Sue Hicks (the subject of the Johnny Cash hit song A Boy Named Sue, by the way). It was also Hicks who came up with the idea of calling upon the popular Christian lawyer/politician William Jennings Bryan to serve as head of the prosecution of John Scopes. When the ACLU chose the famous criminal lawyer and outspoken atheist/agnostic Clarence Darrow to head the defense team for John Scopes, a high visibility trial was virtually guaranteed. Bryan had been the leader of the Democratic Party for 25 years and had run three times unsuccessfully for president of the United States. While considered a conservative Christian, his political views were very liberal for his time; indeed even the arch liberal Clarence Darrow supported him in his first two attempts for the Presidency. Bryan served as Secretary of State under President Woodrow Wilson. 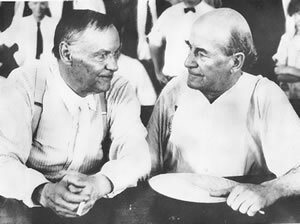 Clarence Darrow (left) and William Jennings Bryan chat in court during the Scopes trial. Technically, the only legal issue in the Scopes trial was: did John Scopes violate the Butler Act by teaching that man descended from a lower order of animals? For both Bryan and Darrow, however, the real issue wasn’t Scopes’ guilt or innocence, but rather should evolution be taught as fact in the public schools? Darrow had hoped to have a number of evolutionist scientists testify in the court to the “fact” of evolution, but this wasn’t permitted by the judge because the evidence for evolution was technically not at issue in the trial and Darrow refused to allow his evolutionists to be cross-examined by the prosecution. As a result, most of the testimony by the scientists at the trial was written and filed into record—none was heard by the jury. Anyone taking the time to read the transcript of the Scopes trial (available from AiG and called The World’s Most Famous Court Trial) will note that Darrow and his defense team of lawyers knew little about evolution and failed in their efforts to establish why it was necessary to teach evolution in the classroom. They lamely attempted to justify its reality and importance by equating evolution with human embryology. For example, the development of the embryo from a single cell (the fertilized egg) was often cited as evidence that all life came (evolved?) from a single cell. Even the evolutionary expert Dr. Maynard Metcalf of Johns Hopkins University confused evolution with human embryonic development and the aging process! Much of Darrow’s efforts at the trial amounted to a caustic diatribe against the Bible and Christianity. His anti-Christian hostility was so intense that there was fear on the part of liberal theologians and organizations that supported his evolutionary views that he might turn popular opinion against them. Darrow even turned his anger and hostility against Judge John T. Raulston by repeatedly interrupting and insulting him for which he was cited for contempt of court. After a self-serving apology from Darrow, Judge Raulston forgave Darrow for his contempt with these words: “The Man that I believe came into the world to save man from sin, the Man that died on the cross that man might be redeemed, taught that it was godly to forgive and were it not for the forgiving nature of Himself I would fear for man. The Savior died on the Cross pleading with God for the men who crucified Him. I believe in that Christ. I believe in these principles. I accept Col. Darrow’s apology.” It’s difficult to imagine a judge saying such a thing in our “enlightened” day, but not difficult to imagine what would happen to one who did. On the seventh day of the trial, Darrow challenged Bryan to take the witness stand as an expert on the Bible. Going against the advice of his co-counsel, Bryan foolishly agreed to this outrageous and unprecedented arrangement, with the agreement that Darrow would in turn take his turn at the witness stand to be questioned on his agnostic and evolutionary views. In his questioning, Darrow sarcastically and often inaccurately recounted several miracles of the Old Testament such as Eve and the serpent, Jonah and the whale, Joshua’s long day, Noah’s Flood, confusion of tongues at the tower of Babel and biblical inspiration. Darrow ridiculed Bryan for his belief and defense of these miracles, but Bryan steadfastly stuck with the clear words of Scripture, forcing Darrow to openly deny the Word of God. When Darrow asked “creation might have been going on for a very long time?,” Bryan replied that “it might have continued for millions of years.” With the help of Bryan’s compromise on the days of creation, Darrow achieved his goal of making the Bible subject to reinterpretation consistent with the ever-changing scientific and philosophical speculations of man. On the eighth day of the trial, Darrow asked the judge to instruct the jury to find his own client guilty as charged. This unprecedented concession of a client’s guilt by a defense lawyer kept Darrow from taking the witness stand as promised. One can only imagine what sort of questions Bryan might have asked Darrow about his beliefs in agnosticism and evolutionism after what Darrow had put him through. John Scopes was found guilty of violating the Butler Act and assessed a fine of $100, but was subsequently acquitted by the Tennessee Supreme Court on a technicality. The Butler Act itself was repealed in 1967 in Epperson vs. the State of Tennessee. Today in Tennessee as in all other states in America, a mindless and purposeless process of evolution is the only legally permissible explanation for the origin of man and all other forms of life in the public school science classroom. To see firsthand how the propaganda piece, Inherit the Wind, has continued to deceive a whole generation with its countless distortions and inaccuracies, be sure to watch the DVD, Inherently Wind: A Hollywood History of the Scopes Trial. This DVD gives side-by-side comparisons of Hollywood’s version of the trial versus actual historical events. Once you know the truth about what really happened in Dayton, Tennessee, why not help to set the record straight by passing along a copy of this DVD to your local public school or donate it to a local library?